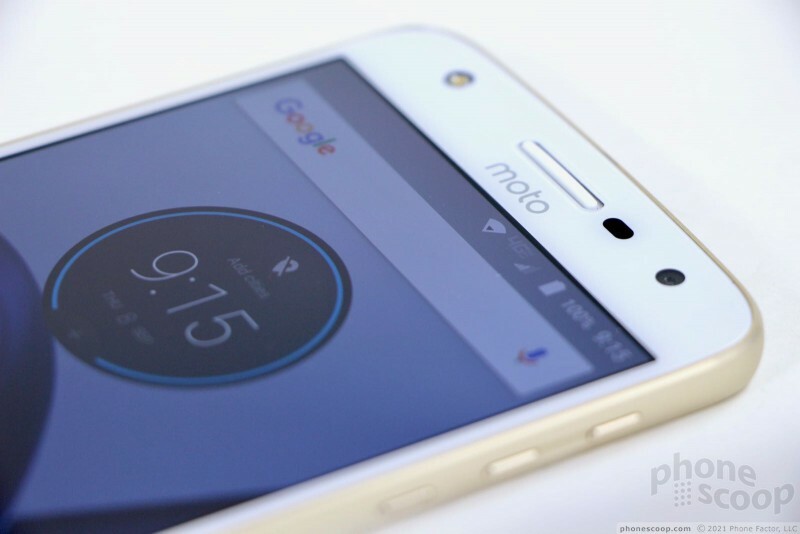 The Moto Z Play Droid is a less-costly, less-powerful version of the Z Droid and Z Force Droid handsets Motorola released earlier this year. If you're interested in Motorola's innovative system of Moto Mods but are looking for a lower point of entry, the Moto Z Play Droid is it. 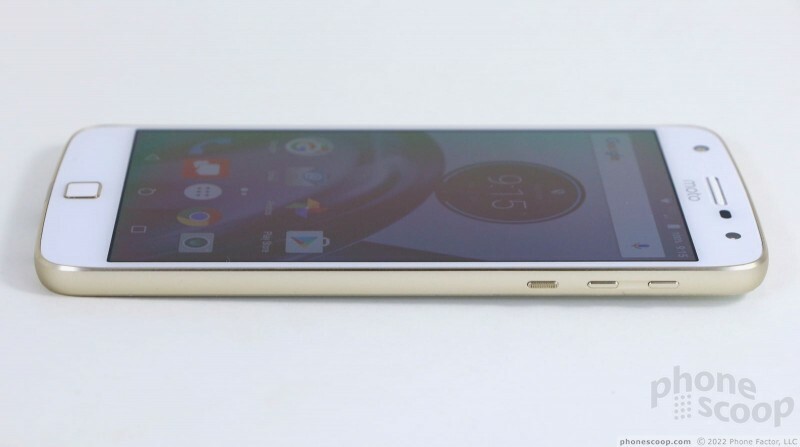 Moreover, Motorola claims the Z Play has its longest-lasting battery ever. 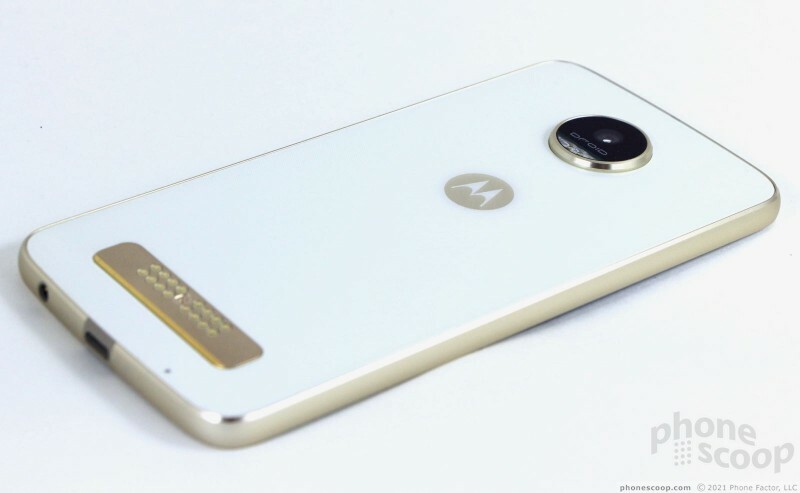 The Moto Mod system demands certain commonality among compatible phones. 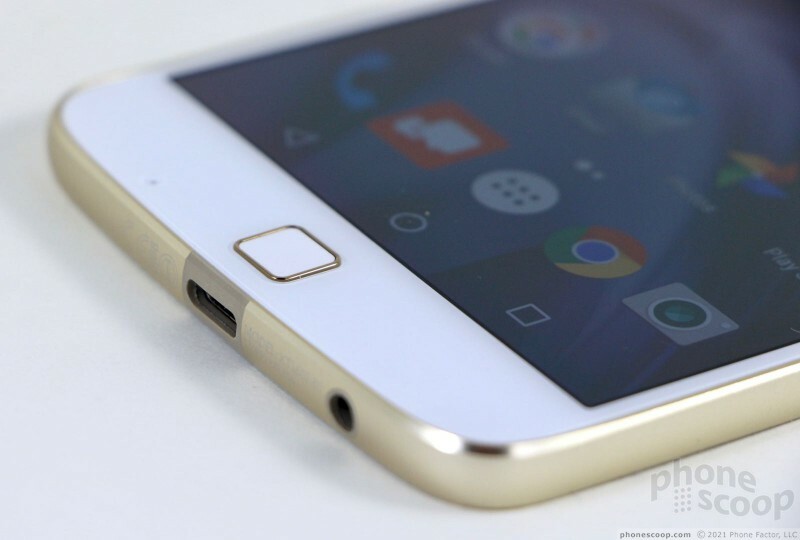 That means the basic shape and appearance of the Z Play matches those of the Z and Z Force. It carries over the size (length/width) and profile. The Z Play is more similar to the Z Force than the Z thanks to its thickness and weight, but there are plenty of subtle differences (other than price/specs) that set the Z Play apart from its stable mates. The Z Play is made of metal and glass. The face features 2.5D curved glass that's fitted precisely into a machined metal frame. 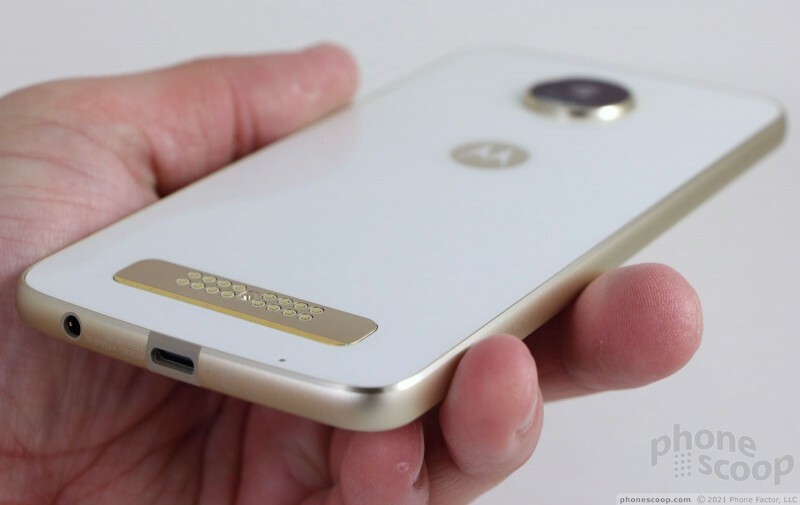 The rear is glass from top to bottom (a change from the metal-backed Z and Z Force). 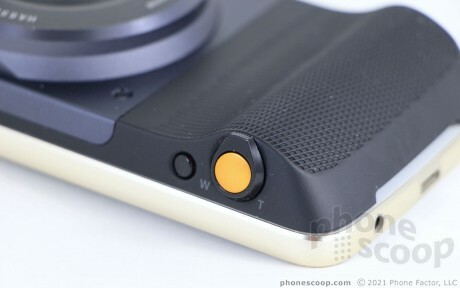 The copper-colored contacts stand out visually and the huge camera module looks like a robot eye, staring at you. The camera and copper contacts are arranged in precisely the same locations as on the Z and Z Force so the Z Play may accommodate the Mods. 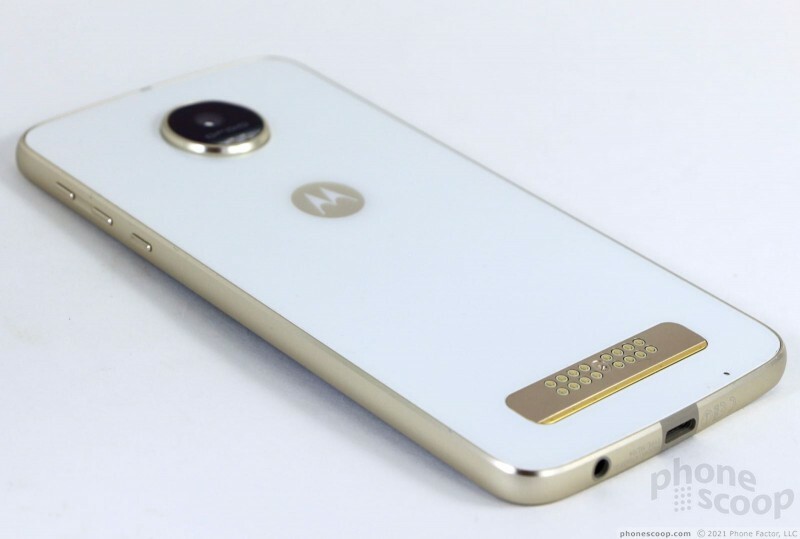 Our review unit has white glass and gold metal accents, but a black/gray version is also available. The Z Play is a modern phone through and through. It's probably worth noting that the dual glass panes make it more likely to break when dropped. Thankfully a plastic rear cover mod comes in the box. The Z Play is a big ol' phone. The thickness and weight are the only two major physical specs that differ from the Z and Z Force, and even then just barely. 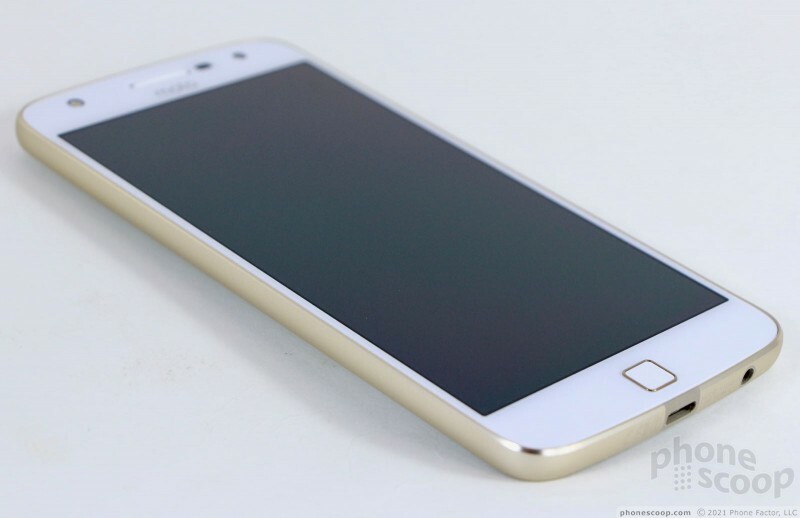 The phone measures a hair thinner than 7mm, and the weight isn't bad at 5.82 ounces. The Z Play is a two-handed phone and may not work for people with small hands. The device fits into most pockets quite easily, but the weight makes it fairly noticeable as you walk around. The materials, manufacturing, and quality are top-notch. The frame hugs the front and rear glass panels tightly. The phone looks and feels like a more expensive flagship. The Z Play hardware is on par with the best phones in the market. Bezels are more visible on the Z Play than the other Zs due to the design and color combo. 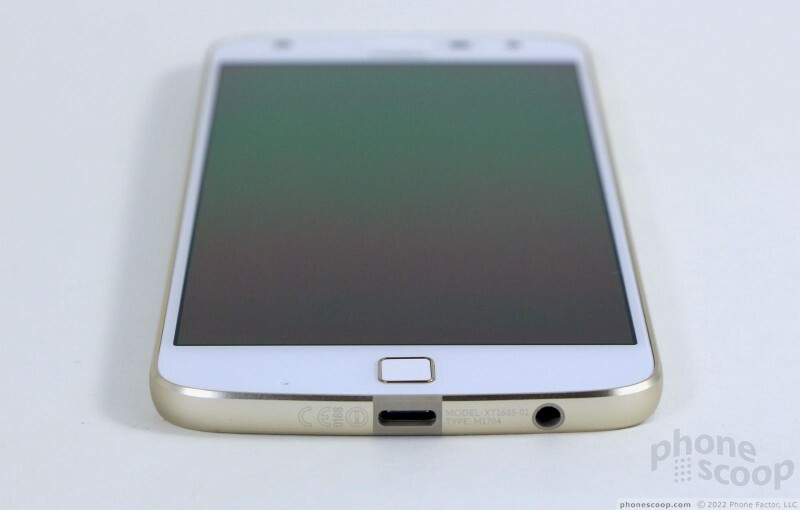 The side bezels are fairly thin, but there's plenty of white above and below the actual display. A raised lip signals the location of the earpiece above the screen. The user-facing camera is off to the right, while the selfie flash is off to the left. (This is opposite the Z Force.) It's easy to spot the square-shaped fingerprint reader below the screen, especially with the gold-colored rim calling it out. The Z Play doesn't use physical buttons and instead relies on software controls for the Android operating system. The fingerprint button does not double as a home button. 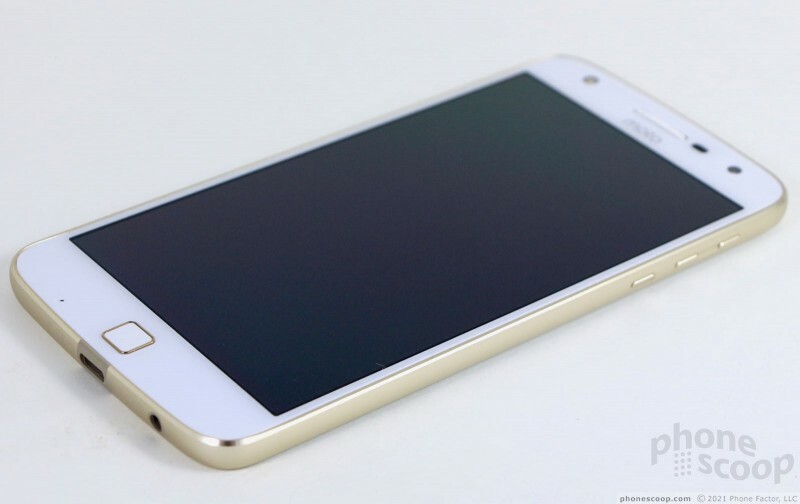 The Z Play's metal frame is shaped differently than those of the Z and Z Force. The Z Play has a more rounded, smooth shape, with chamfers. All of the buttons are on the right edge of the phone. The screen lock button is the first button your thumb encounters as is slides up the side. The button is small, but has a sharp, ribbed texture that makes it easy to find. Travel and feedback are good. The volume controls have been separated into two buttons. These keys have a smooth texture to differentiate them from the lock screen button, but are about the same size/shape and deliver the same travel and feedback. When you're in a hurry, it is easy to mistake one for the other. The dual-purpose SIM and memory card tray is tucked into the top edge. Interestingly, the Z Play includes a 3.5mm headphone jack, something the pricier Z handsets notably lack. 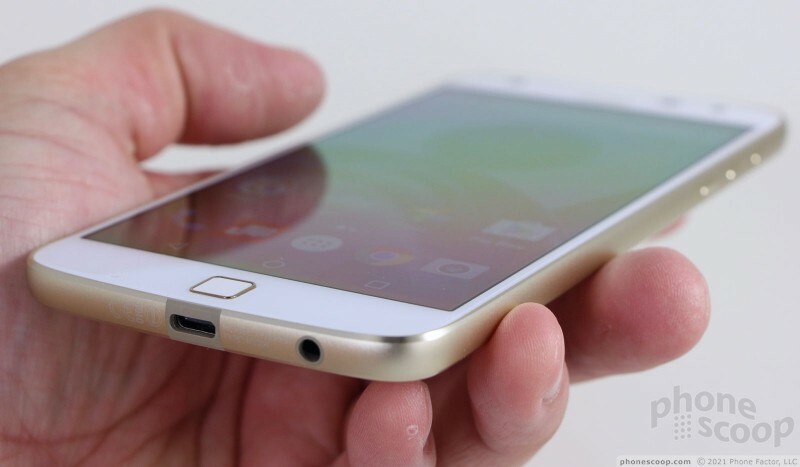 This is likely due to the phone's increased thickness and internal space. 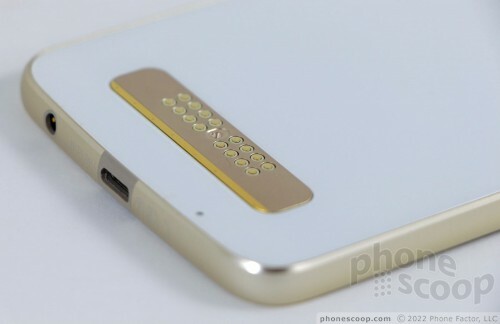 The USB Type-C port is positioned next to the headphone jack. The Z Play's rear panel is certainly unique. You can't help but notice the camera bulge, and unique contact panel. The camera module is about the size of two stacked quarters. A reflective, gold rim calls your eyes to it. The two-tone LED flash is tucked into the bottom of the circle. The glass itself has a fine, circular pattern painted underneath that's only visible at the right angle and up close. The stylized "M" logo is painted in gold below the camera. Classy. 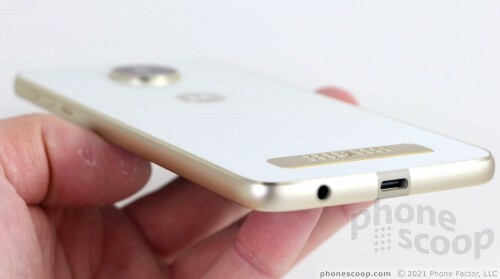 Motorola's proprietary module connector is positioned near the bottom of the rear panel. Motorola says it engineered the heck out of this magnetic system. Indeed, the magnets — which are hidden under the glass — seem incredibly strong and robust. For example, I was unable to shake modules off of the phone despite vigorous attempts. You may not be able to shake the modules off, but they do pop off easily with some pressure in the right spot. The glass rear panel cannot be removed and neither can the battery. That may be a dealbreaker for some. But really, it shouldn't be, considering one of the mods is a spare battery. Absolutely nothing about the Z Play suggests it is less refined than the Z and Z Force. If anything, the glass surfaces make it look even more polished. It is a really nice piece of hardware. 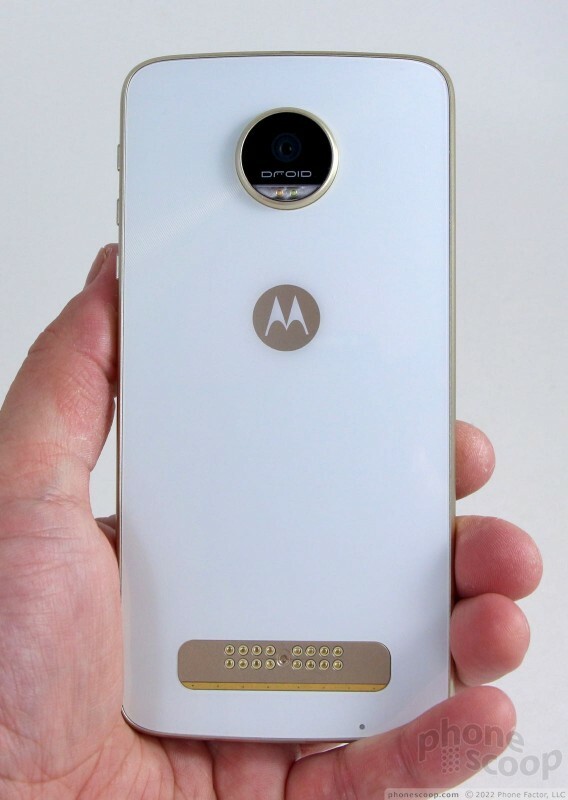 In order to drop the price point, Motorola had to drop the display resolution from quad HD (2K) down to 1080p full HD. The display still measures 5.5 inches across the diagonal, but has significantly fewer pixels. But your eyes probably won't notice; full HD is a sufficient resolution for this screen size and ensures that on-screen elements are smooth and sharp. The screen's brightness is excellent for indoor use, but — like the Z and Z Force — only rates “adequate” for outdoor use. You need to boost the brightness all the way in order to see the screen under sunny skies. Color accuracy is quite good, as are viewing angles. I didn't see any brightness shift, nor color change when I tilted the phone back and forth. 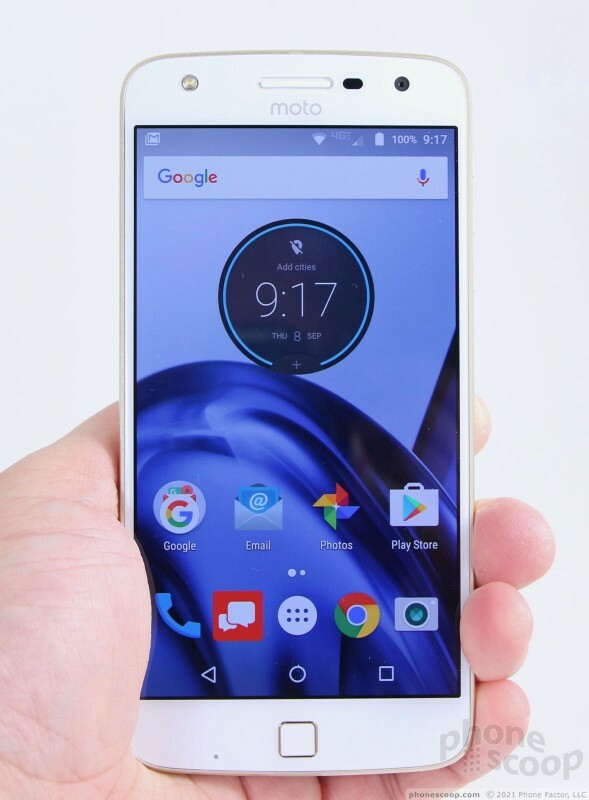 Bottom line: the Moto Z Play has a good screen. The Z Play remained connected to Verizon's LTE 4G network at all times; not once did it lose signal. I was able to make calls everywhere I took the Z Play in the metro NYC area, and the phone easily held calls at highway speeds. Data speeds were quite good. I was pleased with how swiftly the Z Play was able to upload images to Twitter or download apps from the Play Store. The phone streamed high-quality YouTube videos and Spotify tracks without any hiccups. 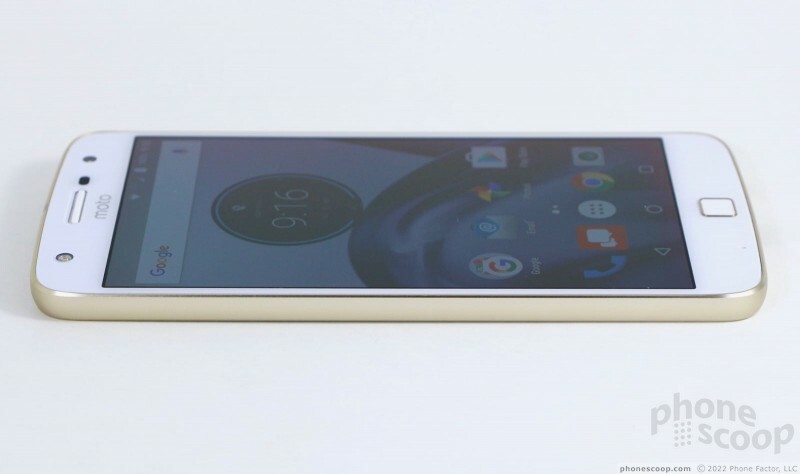 Motorola's wireless roots give the Z Play the solid network grip today's consumers demand. Phone calls are slightly better via the Z Play than the Z or Z Force on Verizon's network, which is to say on par with most Verizon phones. Clarity is interrupted by distortion in the earpiece from time to time, but volume is quite good. This means I was able to hear calls in quiet places like my home or car as well as public spaces such as a coffee shop, mall, or city street. I'm glad Motorola was able to fine tune the Z Play's call quality. People I spoke to through the Z Play said I sounded "just ok."
The earpiece doubles as the speakerphone. When used as a traditional speakerphone (phone on a table/desk while you sit or stand nearby), the Z Play is decent, but not the best I've heard. The speaker produces enough sound for conversations in moderately noisy spaces, such as a moving car. Clarity via the speakerphone is decent, but introduced a bit more distortion than the earpiece, especially with the volume cranked up. The phone includes Verizon's Advanced Calling, which delivers HD Voice over VoLTE. Call quality via HD Voice was clearer than over Verizon's regular voice network. Ringers and alert tones could be improved with more volume, but the vibrate alert always got my attention. Motorola stuffed the Z Play with a massive 3,510 mAh battery — that's 17% more capacity than the Z Force and 35% more capacity than the Z. The company claims the device can deliver up to 50 hours of mixed use, or more than two full days. 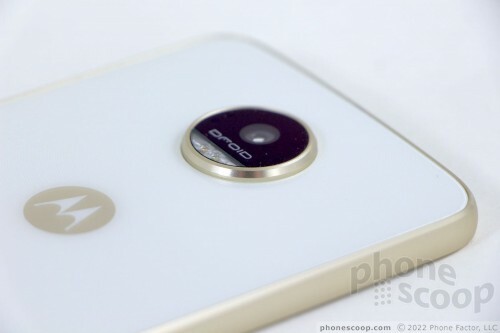 My tests conclude that Motorola's claims are about right. There's no question the phone can go from breakfast on Day 1 to bedtime on Day 2 with a solid reserve still in the battery. I was never able to fully deplete the battery during my tests over a week's time. This phone crushes most others I've tested. If you want mega battery life, the Z Play should be your top pick. The phone includes only the standard Android battery tool. This can be set to come on automatically, or switched on/off when needed. It reduces processor output, dims the screen, and cuts down notifications. The Z Play supports rapid charging via the USB-C port. Motorola says 15 minutes of charging adds 9 hours of life to the Z Play. There's no doubt the phone charges rapidly. 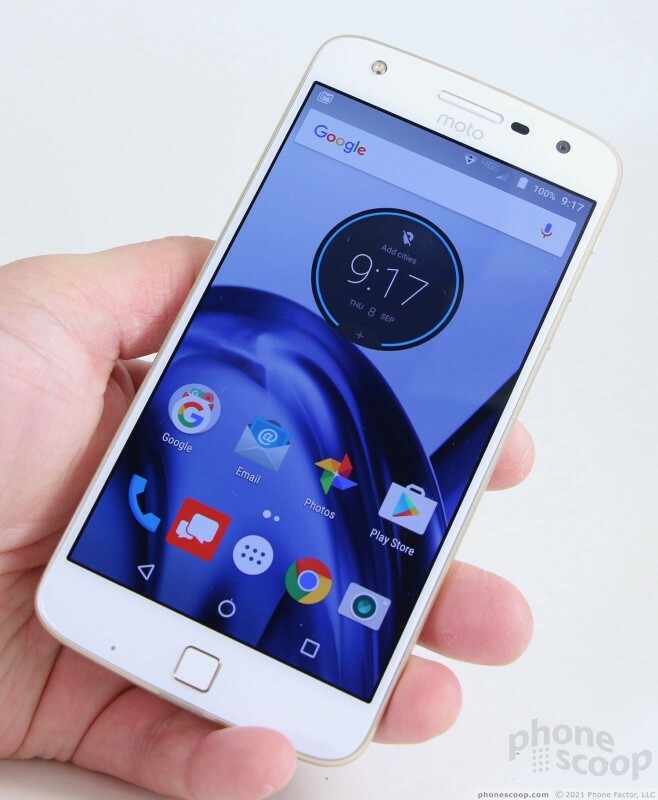 The Moto Z Play offers excellent Bluetooth functionality. Pairing with other devices via the system menu was easy enough, but I used NFC pairing whenever possible. I connected the Z Play to speakers, headphones, PCs, and my car with little effort. Call quality was surprisingly good when pushed through a dedicated headset. Music sounded excellent through a pair of Bluetooth speakers. The NFC radio supports Bluetooth pairing, as noted, but also works with Android Pay for mobile payments. Google Maps made excellent use of the Z Play's GPS radio. 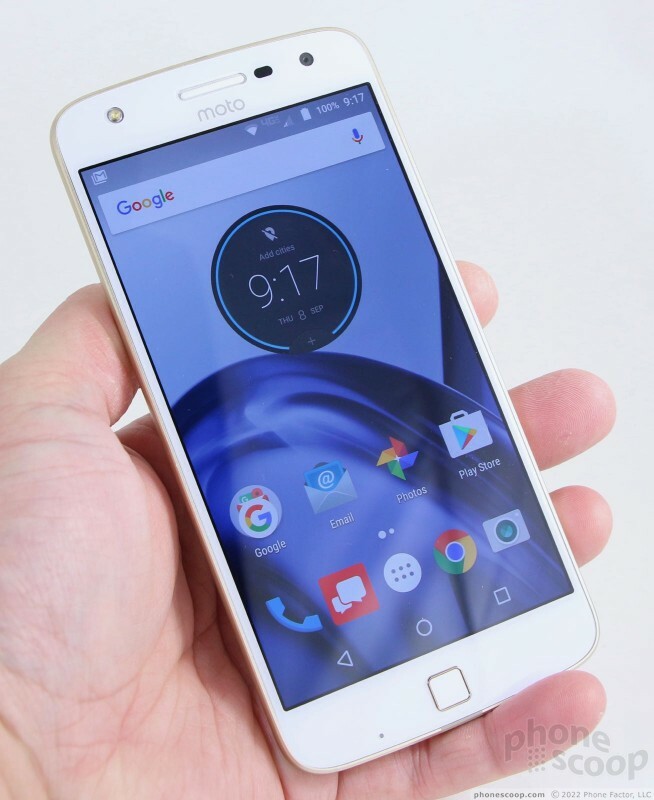 The phone found me in a blink and worked great as live navigation tools when driving from Point A to Point B.
Lenovo today said it will offer unlocked GSM variants of the Moto Z and Moto Z Play handsets later this fall. Pre-orders will kick off on September 15, with availability expected in early October.